Home to not just one, but two championship golf courses on 384 acres of immaculate grounds, The Okanagan Golf Club in Kelowna is a destination venue like no other for your golf event. The Les Furber-designed Quail is a favourite of local golf enthusiasts and features dramatic elevation changes and breathtaking views. The Bear, by Nicklaus Designs, is a 6,885-yard course featuring sculpted fairways surrounded by charming wooded hills. 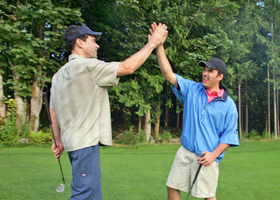 Together, these courses can accommodate up to 350 golfers. Talk to our golf event organizers about special options for your golf event such as CPGA teaching clinics or on-course competitions; our professional team will also work with you to plan a post-tournament meal in the restaurant, or a fully-catered banquet in one of our function rooms.